DIY Tips on Cleaning Up Your Home from Fire and Smoke Damage - ServiceMaster By American restoration Services, Inc.
House fires are mentally exhausting and physically destructive. 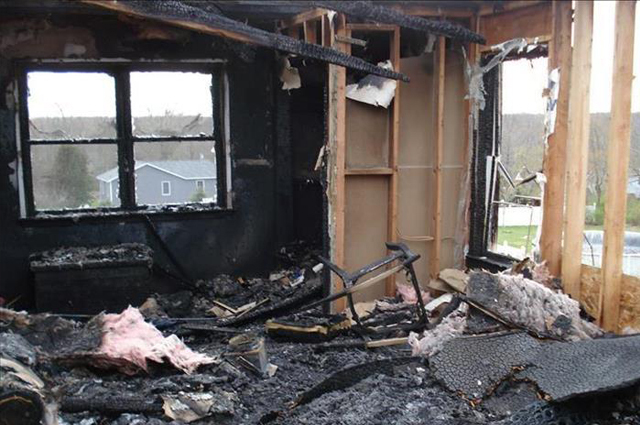 Not only does it result in loss of properly and unfortunate cases lives, recovering from a fire can also be difficult. And putting out the fire is only the beginning in the process of recovery. The real work starts after that. Living in a fire affected house without cleaning it up can prove to be hazardous. All the smoke and soot that is left behind can be harmful and should not be neglected at any cost. Below are some useful DIY tips to help you clean up your home from fire and smoke damage. Clean all the loose soot and dust particles from the walls using a vacuum cleaner. Make a solution using one gallon of water and 1 tablespoon of Trisodium Phosphate (TSP), and use a sponge to wipe the wall surface with it. Dip some rags into warm water and use it to clean up the walls. Make sure you are wearing professional rubber gloves and safety goggles. You can then follow it up by priming and a fresh coat of paint. The walls of your house can absorb smoke odor. You can use some household items to get rid of this smell. Either you can use soapy/detergent water to wash down your walls (if washable) or you can use white vinegar which also works for your floors and furniture. You can also consider other alternatives like baking soda, activated charcoal, etc. If the fire hadn’t been a minor one, the damage could be on molecular level. In that case, we recommend you to take professional help to steer clear of any health hazards. While you might require discarding a considerable part of your fabrics, you can still save some of them. Use a vacuum clear to get rid of all the soot which might stain your textiles further if not cleaned immediately. Deodorize the carpets, curtains and other fabrics using dishwashing detergent or if the fabrics are bleach friendly, you can use a solution of 4-6 tablespoons TSP and a cup of household bleach. Though there are methods which enable you to clean up the mess yourself, it’s a daunting task. Just cleaning it up to make it showy again doesn’t count. The injurious particles can continue to harm you in spite of all the hard work on your part. If the fire had been intense and you can see soot and smoke everywhere, we suggest you to hire professional fire damage restoration services. Professionals can handle major fire damage much better than you can.